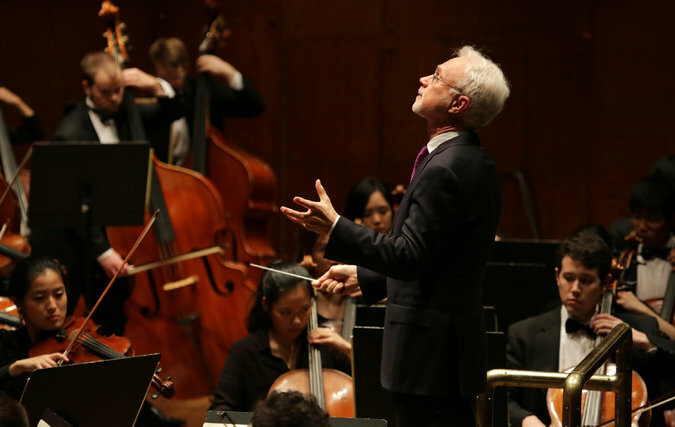 About 24 hours before protests organized by various Jewish groups against the Metropolitan Opera’s production of John Adams’s “The Death of Klinghoffer” were anticipated to start at Lincoln Center, Mr. Adams was at Avery Fisher Hall on Sunday afternoon, conducting the Philharmonia Orchestra of Yale in a terrific concert. There were no protests or disruptions of any kind on Sunday. When Stravinsky wrote “The Soldier’s Tale,” his 1918 dramatic work that combines spoken text with a seven-piece chamber ensemble, he had in mind the touring puppet shows and playing troupes he encountered in the Russia of his youth. Over the years, when “The Soldier’s Tale” has been presented as a staged drama or a ballet, it has often been updated or mythologized. It is probably best known as a concert work, without its spoken text. With the centenary of Stravinsky’s Rite of Spring safely behind us, there’s value in a reminder of the great variety of music the composer brought out through his long career before and after the Rite‘s riotous 1913 premiere. 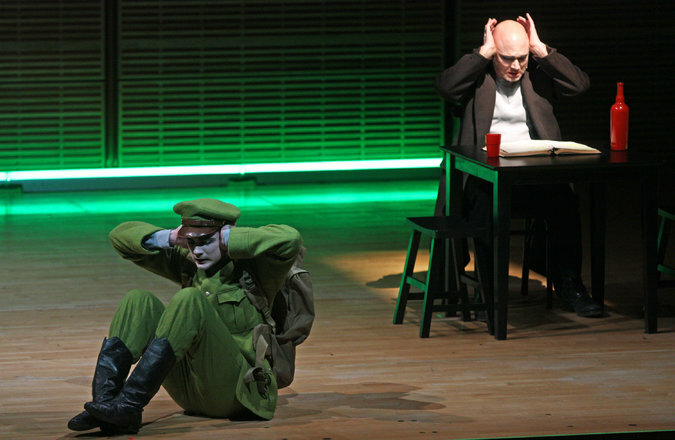 Yale in New York brought an enchanting new production of the dance-theater piece The Soldier’s Tale to Carnegie Hall’s downstairs hall last night, featuring Michael Cerveris in the key role of the Narrator and Yale drama students in the dancing/speaking roles. The Sonata No. 10 “The Crucifixion,” by the 17th-century virtuoso violinist Heinrich Ignaz Franz von Biber, unfolds in a blaze of effects, beginning with slashing chords perhaps intended to depict the nailing of Jesus to the cross. The violinist Daniel S. Lee offered a fleet-fingered, passionate interpretation of the work on Saturday at St. Ignatius of Antioch Episcopal Church on the Upper West Side of Manhattan, part of Tenet’s TENEbrae series commemorating Lent. In the 20 years that Alfred Newman (1901-70) was head of 20th Century Fox’s music department, he scored 200 movies, earned 45 Oscar nominations and took home nine Academy Awards. He also had a son. As of today, Thomas Newman has garnered 12 Oscar nominations of his own as a motion picture composer, but no wins. That could change March 2, when he’ll find out if his latest nomination — for the “Saving Mr. Banks” score — turns into gold. Thomas’ music is alive with the kind of emotion his father (once described as the “godfather” of cinema soundtracks) brought to such films as “The Captain From Castile” and “How to Marry a Millionaire.” In telling the story about how Walt Disney (Tom Hanks) persuaded reluctant and mean-spirited author P.L. Travers (Emma Thompson) to give him the movie rights to “Mary Poppins,” “Saving Mr. Banks” allowed Newman to re-create many of the songs brothers Richard and Robert Sherman wrote for the “Poppins” movie, presented in the new film as demo pieces[…] But there are also Newman’s original contributions, adding depth to the dramatic flashbacks of Travers’ alcoholic father and the introduction of the woman who would later inspire the Poppins character. To call Van Cliburn Competition winner Sean Chen’s performances of Brahms, Beethoven, and Bartok “crystalline” does more than make a pun, as you can hear for yourself. Michael Cirigliano II, Content Editor at Feast of Music, selected the April 12 “Serenade and Metamorphosis” program as one of his three top performances of 2013. A mix of faculty, alumni, and current students from the Yale School of Music’s string program descended on Zankel Hall, giving an electrifying performance of Richard Strauss, Tchaikovsky, and composition alum Matthew Barnson’s new work, The Rule and Exercises of Holy Dying. The evolution from Strauss’ post-World War II lament to Barnson’s ethereal whispers was delivered in a remarkably polished performance, led by violinist Ani Kavafian. The fact that the hall was less that half full will remain one of 2013’s greatest mysteries.